Introduces language students to 30 classic works of British and American literature, to be read for enjoyment and for language development. 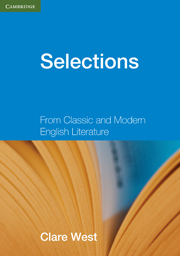 Selections introduces language students to 30 classic works of British and American literature, to be read for enjoyment and for language development. The range of writing spans nearly 300 years and the texts are arranged chronologically by date of publication. 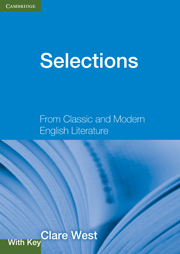 The extracts have been carefully chosen to be suitable for use at intermediate to upper-intermediate level.The texts are accompanied by: a short biography of each author including their literary characteristics and achievements; comprehension questions on author and text; discussion questions to encourage free expression; language extension exercises covering grammar, vocabulary, word-building, idioms and phrasal words; composition work and role-plays.